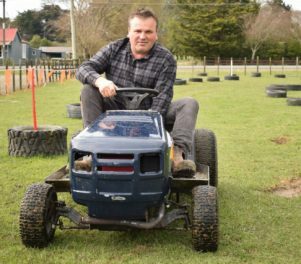 Things are getting serious in Eketahuna lawnmower racing circles. The club was set up last year and has nine members. Megan Gray died in April last year at the age of 42 after a battle with stomach cancer, and Alan held a fundraising race event for Arohanui Hospice in September. That attracted eight entrants, but what is now planned as an annual event on March 9 has already attracted interest from around 25 registered racers. But for those who fancy their chances having just broken the record for mowing their lawns – Gray warns “they’re not your average ride-ons”. Racing mowers must meet the safety and construction specifications set down by the New Zealand Lawn Mower Racing Association, which recognises four classes, starting with a “stock mower” – a ‘redneck’ – and moving up to Class 3. In the highest class, mowers can reach speeds in excess of 70kmh – a Cambridge racer has clocked 94kmh. “He’s coming down in March – they can be pretty spectacular. “But it’s not just about the speed, it’s how they drive them. To meet association rules, mowers at higher grades must be lowered and widened, as well as having kill switches on lanyards added, similar to those on jet skis. But it is relatively simple to get started. “At redneck level, all you have to do is take the blades off, change the ratio on the pulleys, and add the kill switch, which costs about $10. A new track on Gray’s property will be in use for the March event, which is timed to take advantage of more settled weather and a quieter period for dairy farmers who are among enthusiastic racers. At between 650-750m in length, the new course is around three times the length of the track used in September. That event raised around $1600 for the hospice – more is hoped for in March. “We haven’t set a target, but we had eight entries last year and we’ve got 25 this time. You can work out the math,” Gray said. Club president Mike Rzoska says regular club meetings are usually followed by a few turns around the track. “Everyone gets out on the track for a trial. That sorts out any faults. If there’s any weak spots they break or blow up,” he said. Rzoska lives in Carterton but his involvement in racing has grown steadily since the first event at Eketahuna. 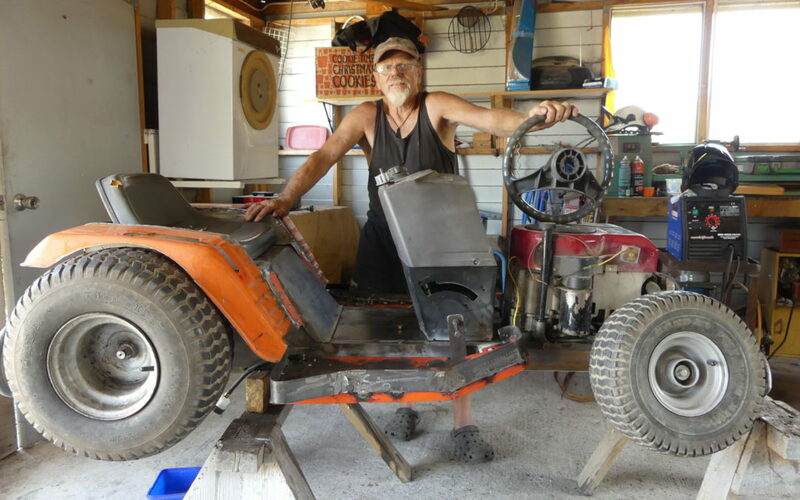 He’s since bought five machines.– several engines and assorted parts are hard to miss in his garage. But he is currently without a machine to race. Entry for racers in the March 9 event is $20, with a gold coin donation for spectators. See the Eketahuna Lawn Mower Racing club Facebook page for information.